The results of an exploratory clinical trial indicate that a wearable artifical kidney could be developed as a viable, new dialysis technology. Some redesigns would be required to overcome device-related, technical problems observed during the testing. The findings are reported June 2 in JCI Insight, a peer-reviewed medical journal of clinical investigations. Read the paper. The technology may become an alternative to conventional hemodialysis for people with end-stage kidney disease. Present-day treatment generally requires three sessions a week on a stationary machine that restricts patients’ ability to walk around while it is attached and running. In contrast, with a wearable device patients would no longer be tethered. In addition to mobility, it would also provide additional treatment benefits from longer sessions or more frequent days of dialysis. The Food and Drug Administration-authorized trial of a prototype for such a device was performed with seven patients at University of Washington Medical Center in Seattle in the autumn of 2015. The patients were treated with the device for up to 24 hours. A collaboration with the U.S. FDA Center for Device and Radiological Health, through its Innovation Pathway 2.0 program, supported the development of the device. Those leading the non-randomized trial included the inventor of the Wearable Artificial Kidney prototype, Dr. Victor Gura of Cedar-Sinai Medical Center and chief medical officer of Blood Purifications Technologies in California. The senior researchers on the trial were Dr. Jonathan Himmelfarb, UW professor of medicine, Division of Nephrology, and director of the Kidney Research Institute, and Dr. Larry Kessler, professor of health services in the University of Washington School of Public Health. The Kidney Research Institute is a program of Northwest Kidney Centers and UW Medicine. The trial was conducted to determine the safety and efficacy of the device – its ability to take over some functions of failed kidneys. The researchers also wanted to ask the participants about their impressions of the experimental treatment, and to compare those with standard dialysis treatment. In the patients studied, the device was shown to effectively clear the blood of waste products, like urea, creatinine and phosphorus while removing excess water and salt. These are normally filtered out and eliminated by working kidneys. The usual diet for patients on standard dialysis is highly limited. In contrast, on the Wearable Artificial Kidney, the patients’ blood electrolytes – like sodium and potassium -- and their blood fluid volume remained balanced during the test, even without any diet restrictions. Regulating the volume and composition of body fluids is another job of normal kidneys. During the trial, the participants tolerated the treatment well and did not have any serious, adverse effects. The circulatory system, which keeps blood moving throughout the body, stayed stable in all the patients. However, the trial was stopped after the seventh patient because of technical problems with the device. These included the excessive formation of carbon dioxide gas bubbles in the dialysis solution, and intermittent variations in solution and blood flow. These technical complications, according to the researchers report, will need to be addressed through device redesign and refinement to enhance safety and reliability prior to any further, long-term studies of the Wearable Artificial Kidney. Nevertheless, they added, the findings provide proof of concept that a wearable devise along these lines could be developed as a viable, novel dialysis technology. The patients participating in the study reported greater satisfaction during their treatment with the Wearable Artificial Kidney when compared to their ratings of care during conventional dialysis center treatment. Previous studies have shown that patients and their families highly value treatments that can be given at home and that increase independence and the freedom to travel. The researchers and inventors noted that redesign of the WAK components will be directed at the ease of use and reliability of operation of the device, because the ultimate goal is for treatment to be administered independently at home by the patient or their caregivers. The patient trial of the device was supported by an unrestricted gift from the not-for-profit Wearable Artificial Kidney Foundation. 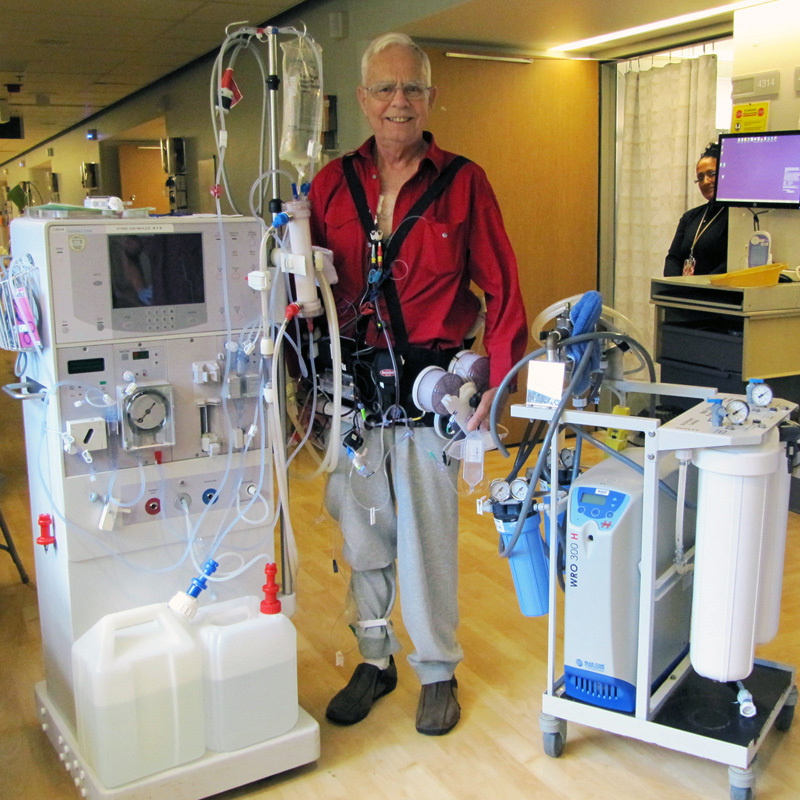 The devices were supplied by the study sponsor, Blood Purification Technologies, Inc.
Nancy Colobong Smith, a nurse researcher on the trial, gives her field's perspective in "Nursing and Research: The Wearable Artificial Kidney Trial."